Thousands of protesters took to the streets in Tokyo on Sunday, forming a human chain outside the parliament building to oppose the planned relocation of a US airbase on the island of Okinawa. The rally was the latest in a series of protests that have been happening across the country. According to Sunday's march organizers, cited by AFP, 15,000 people surrounded the National Diet Building in Tokyo. 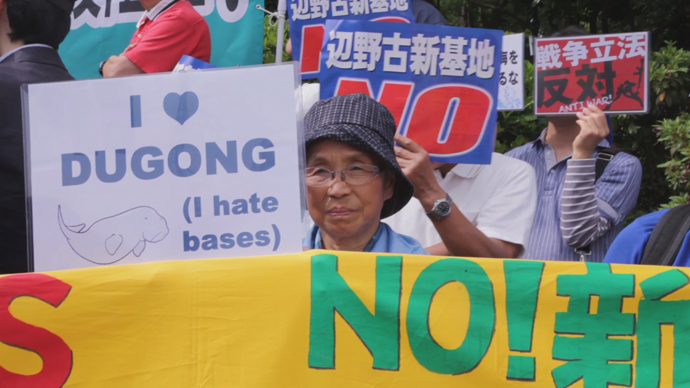 Holding "Government should listen to the people" and "I hate bases" banners, protesters have been demanding that officials stop the controversial relocation of the US military's Futenma base to Henoko, on Okinawa. The relocation of the airbase on the southern island of Okinawa has been met with fierce opposition from the locals, as airbase hosts an estimated 26,000 US troops. Last week, a march outside a US base on Okinawa Island ended in scuffles between police and demonstrators. The Okinawa US air base has been an issue for almost two decades, since it was first proposed in 1996. There has always been strong opposition from the island’s residents, who say they should not have to carry the burden of hosting more than half of the 47,000 US troops based in Japan.